Floating landing stage for passenger vessel on the reservoir "Liptovská Mara". 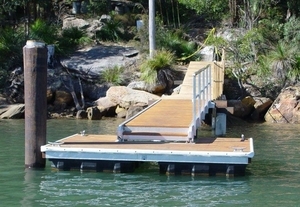 MANDL - Living on Water, Ltd.
Marine Dock Systems has been designing and installing Residential Docking Systems and Pontoons for homes all over Australia since 1981. A landing stage pontoon is a platform, generally floating, where boats can lie alongside, tie up and safely disembark passengers. Certain models also act as breakwaters. Such structures are found at ports, marinas, local boat clubs and sometimes at waterfront villas. Pontoons generally consists of a sturdy, rigid structure of steel, aluminum, wood or concrete supported by a floating element composed of laminates, polystyrene blocks or another system. Designs are often patented. They are covered by flooring of natural, rot-proof wood or synthetic grating. Non-slip paint is sometimes applied. Most have rubber fenders around the edge to absorb the impact of arriving vessels, as well as mooring cleats. Some models have guardrails, swim ladders, lights, water and electrical outlets. Modular versions offer multiple configuration possibilities. Pontoon type, equipment and installation system will be a function of the site. Modular systems are flexible and adaptable. Anchoring methods include attachment to a master chain on the bottom or directly to the shore.